While we might not think about cognitive flexibility in our day to day life, it is an essential skill that we call upon every day to help us navigate and make sense of the world. Cognitive flexibility, also known as flexible thinking, is the ability to shift one’s attention as the demands of the environment or task change. This involves being able to take different perspectives, shift priorities and redirect attention from one thing to another. The quicker you’re able to shift from one perspective to another, the greater your cognitive flexibility. Actually, obtaining greater cognitive flexibility helps children learn, both in and out of school. The ability to easily shift perspective and recognize when the rules change allows us to think in novel ways, act creatively and solve problems. Key academic skills like reading, writing and math are also easier to learn when we can think in flexible ways. For example, kids need to think flexibly about letters to understand that they can have different sounds. They need that cognitive flexibility to grasp the many exceptions and complexities to the rules of grammar. And they need it in math to understand that there’s more than one way to solve a problem. How can we tell that young children are working on cognitive flexibility? Building this capacity starts in infancy. We see babies, working on simply shifting attention from one thing to another— these are the roots of cognitive flexibility to come. As children get older, we start to see them better able to adjust to the shifting rules in a game and better able to take different perspectives. They also get smoother at transitions in general, increasingly able to identify not only what is the most important thing on which to focus, but better able to let their focus move from one thing to another. How can we support cognitive flexibility? Go outdoors! Nature is both calming and stimulating at the same time. It is ever-moving and changing, offering varying sounds, smells, and sensations. No indoor environment can provide such welcoming and plentiful opportunities to shift focus. Model rolling with the flow. Routines are so good for kids, and we by no means advocate disrupting supportive routines. Rather, take chances to embrace the day to day curves that life throws your way. When there is an unexpected change in the flow of a moment or a day, try to slow down, act calm, and actively welcome the change. Talk about it in the moment, exposing kids to your thought process. You can try something like, “Oops! It looks like the store is closed on Mondays. Let’s make a new plan!” Or, “I wasn’t planning on dropping all of the blueberries, but we can have fun picking them up. What is a good blueberry-picking-up song?” No one can nail this all the time, but these opportunities present themselves often, so give it a go when you can. Use surprises to support. Surprises are happy curves in the road of life. We can engineer them often to give kids the chance to delight in shifting the focus of a moment, afternoon or whole day. When you have extra time one day, pull the car over and enjoy a little picnic snack in the park. Take the trail you’ve never taken before, just to see where it goes. Bring a favorite toy on a hike, but unveil it when you are already out there. A child will be delighted, and he will have to shift attention and adjust to this new twist in the adventure. Pretend play! Children tend to start to pretend as toddlers, but they delight in your pretending even earlier than that. You can support early imaginative play with emerging pretenders -- and with it their flexible thinking -- by acting and moving like animals, pretending that an object is something else (e.g. a stick is a spoon for stirring), or pretending to do everyday things like cook, dress or take a bath. All of these types of imaginative play are included in DIY activities like Stone Soup or Build an Outdoor Kitchen. As children grow, support them with lots of chances to engage in imaginary play with you and, increasingly, with other children. As their play grows more complex, marvel at how elaborate the narratives and flexible the rules become. Transform things. Change the rules yourselves by turning things into other things. Turn dirt and water into mud. Find a pile of sticks and decide to build something new and exciting. Take cardboard boxes and, with a little cutting on your part and some painting by your kids, turn them into the houses of your dreams. Play games with shifting rules. 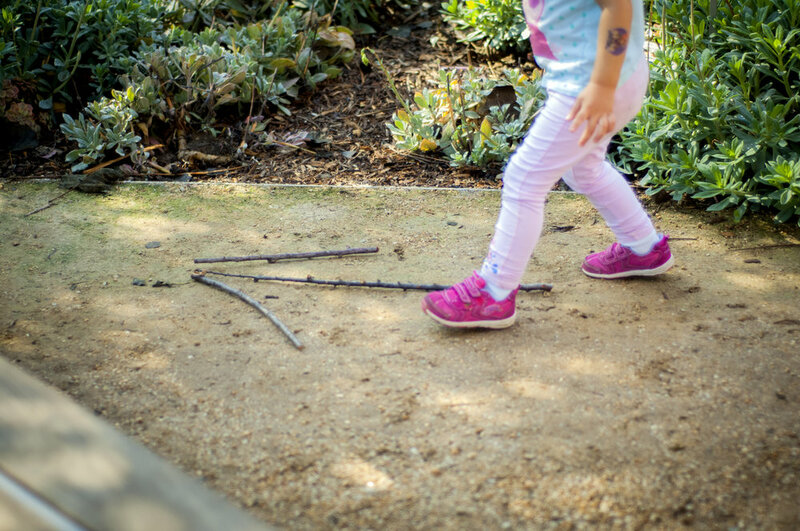 With wee ones, look for simple ways to change the rules of play. If you are pushing your child in a swing or spinning with your child, gently switch directions and delight in that moment of shifting. When you are playing games with kids of preschool age and up, select games that include rule switching or look for ways to take favorite games and switch up the rules. Activities like our Bell Hunt Game are great examples of games in which the rules switch teaching kids to adjust.